There's something about cinnamon and apples that makes this season a little better. 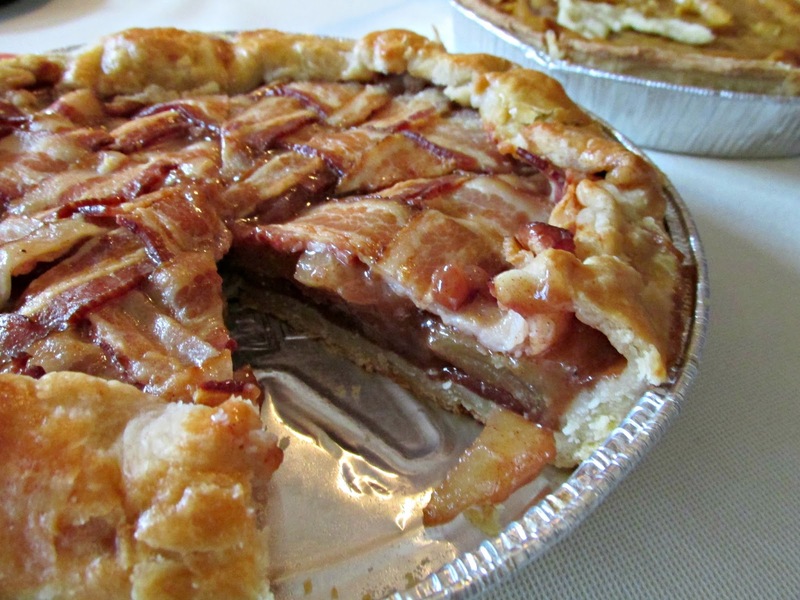 So, when I stumbled upon this bacon apple pie recipe on Pinterset, I knew that Alex & I were going to have to make it. And we did, the night before Thanksgiving, and from scratch too - crust included! 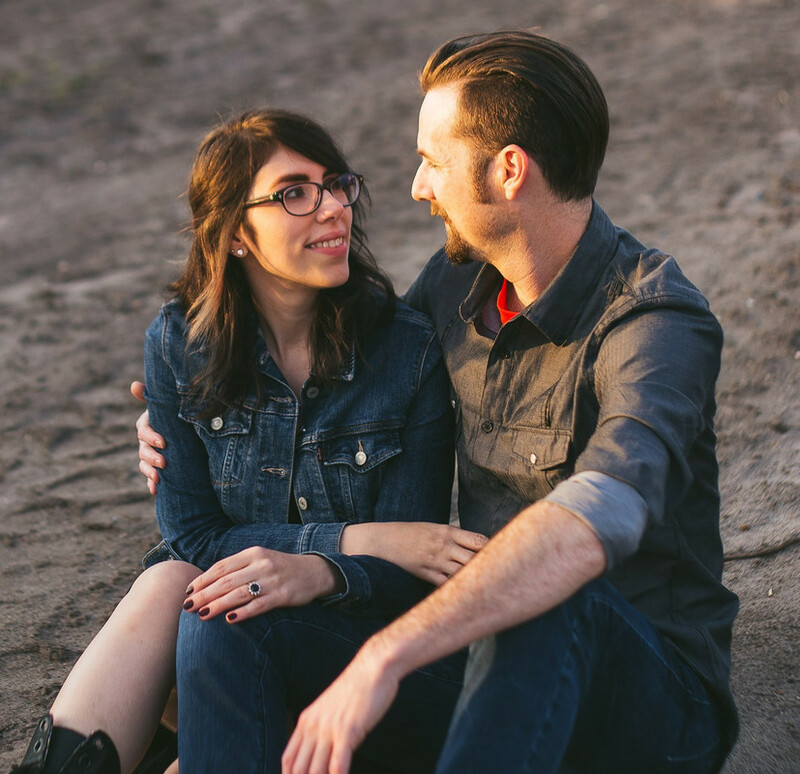 It was such a success that I decided I would share the recipe with all of you. We even managed to find an easier way to add the bacon lattice to the top of the pie so making it will be easy as well, pie! *Using a stand mixer with a paddle attachment makes this a lot easier, but a hand mixer will work as well. Combine flour, salt and sugar in the bowl of a stand mixer fitted with a paddle attachment. Make a well in the center and add the cubes of butter. Mix on medium speed until it resembles sand. Add the apple cider vinegar to a cup of ice water. Slowly add the ice water (you won't use all of it) until dough forms a ball. Make sure the dough is not too sticky, this will happen if you add to much water. If you do, just add a little more flour. Wrap the ball of dough in plastic wrap and let it chill in the fridge for 30 minutes. After it has chilled, lightly flour a flat surface and roll out the dough using a rolling pin. The diameter should be 9 inches, which will leave us with an extra inch of dough to fold over the top of the bacon lattice. Once the dough is flattened transfer it to an 8" pie pan. Crack the egg (with no yolk) and brush it on the pie crust with a pastry brush. 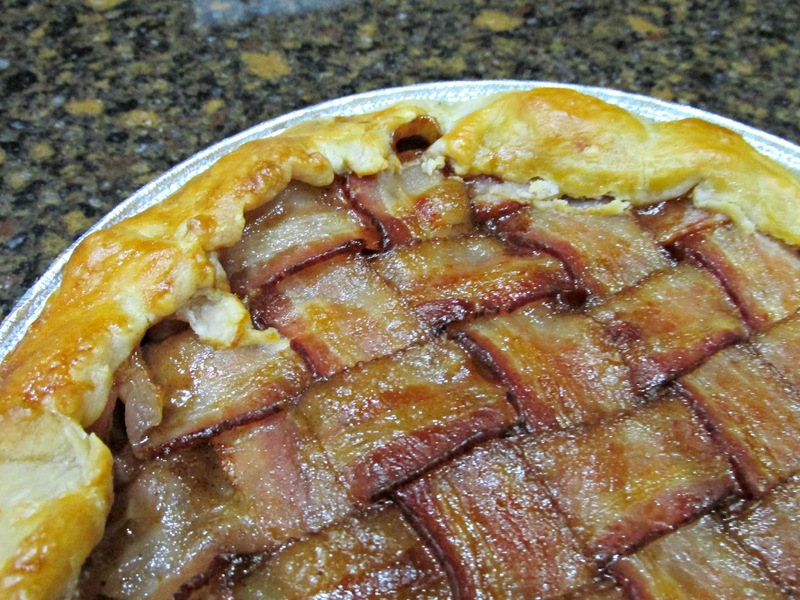 Place in fridge for 10 minutes while you prepare the filling and make the bacon lattice. Place all of the ingredients in a mixing bowl. Toss until the apples are coated evenly. You'll need a cutting board for this step. Take 8 slices of uncooked bacon and weave them by lifting every other strip both horizontally and vertically to create a lattice pattern. Take the pie crust out of the fridge and pour the filling into the pie crust. Hover the cutting board upside down with the bacon lattice facing the pie, center it over the filling and maneuver the bacon lattice on top of the pie. Take some kitchen sheers and cut the excess bacon to where it lines up with the edge of the pan. Fold the crust over the bacon and brush on the egg whites. Place the pie on a baking sheet and bake in the oven for 20 minutes. Rotate and lower the oven temperature to 375oF. Bake for another 30-40 minutes, or until the bacon is cooked. Be sure to keep an eye on the crust and make sure that it doesn't get too brown. 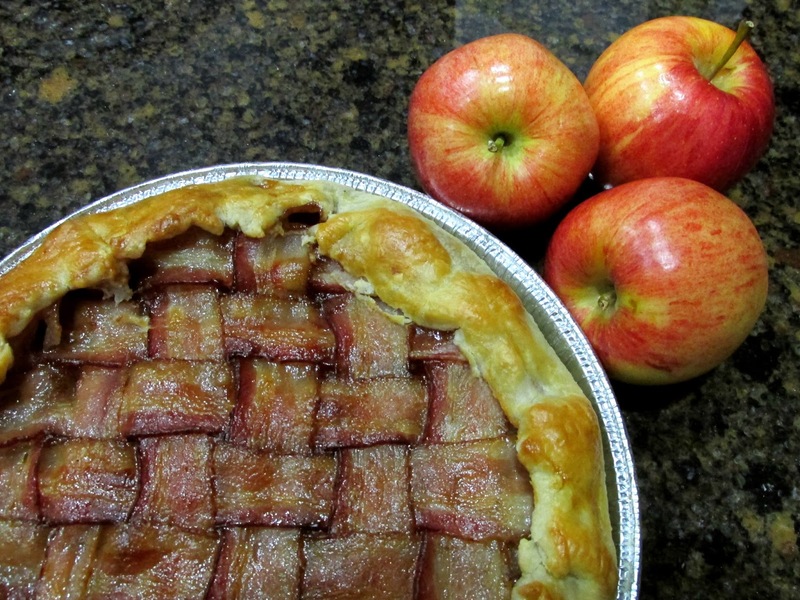 You can place foil over the crust to prevent that if the bacon still needs to cook. Let it cool for an hour. *Adapted from the recipe from For the Love of the South. Now all you have to do is sit down and enjoy this decadent pie with some eggnog while watching Home Alone or Christmas Vacation and you're ready to enjoy the holiday season in all it's glory.